Hate is a powerful emotion, often used for evil more than good, and has most recently inspired an unwelcome trend of prejudice against people of race, gender, religion, sexuality, ethnicity and anything that doesn’t equal a pure-blooded white male in the eyes of a select few. Since the election of Donald Trump, as well as the success of the Brexit campaign, hate has been on the rise with more and more right-wing people feeling confident in their horrific world views and bashing anyone who doesn’t fit their idea of a perfect human specimen; on the other end of the spectrum, there are people who are strongly resisting this hateful rhetoric, and are angrily taking to the streets and online platforms to demonstrate their desire to push back against prejudice in its many forms, hoping that hate will one day become a thing of the past and will be looked back upon as a dark period in human history. Right now, there doesn’t seem to be anyone angrier about the current climate of hate than filmmaker Spike Lee, who in the past has been known for making films that have strongly denounced the way that society treats African-Americans and in some cases turned the whole thing on its head, but with his latest film BlacKkKlansman sets his sights on going after hatefulness of all types, specifically the granddaddy of evil organisations the Ku Klux Klan, in a movie that will not only get under your skin as you’re watching such seething hatred unfold so naturally in these horrible people, but will also act as a stern reminder that prejudice and hate can be an extremely dangerous combination in any form. It’s also one hell of a movie to experience, one that will have you frightened stiff more than most horror films you’ve seen this year, and will leave you exhilarated by just how powerful and entertaining it can be; make no mistake, this is a movie that should absolutely be seen by as many people as possible, and you’ll be so glad that you got to see such a hard-hitting and fantastic movie at a time when it was sorely needed. The film is based on the real-life story of Ron Stallworth (John David Washington), an African-American who in the 1970s quickly rises through the ranks of the predominantly-white Colorado Springs Police Department, starting off in the records room and then eventually finding himself in the intelligence division following an undercover assignment at a civil rights rally. It is here, after finding an advertisement for the Ku Klux Klan in the newspaper, where he spontaneously phones them up and pretends to be a racist white man, kicking off an investigation into the organisation with white Jewish officer Flip Zimmerman (Adam Driver) acting as Stallworth when meeting in person. While Zimmerman (as Stallworth) socialises with the several Klansmen, with the real Stallworth communicating over the phone – even, on more than one occasion, talking directly to KKK Grand Wizard David Duke (Topher Grace) – they uncover a terrorist plot by the group which the two undercover officers must then try and foil. BlacKkKlansman is not necessarily a movie you go see more than once (though multiple viewings are recommended, if only because it’s a great movie that deserves it), because there are parts that are incredibly uncomfortable to stomach, especially as you see the Klansmen in this film being so vile and detestable with every little action they take, from practically breathing the N-word into every conversation, stating that the Holocaust was entirely staged, watching and cheering on a screening of notorious Klan propaganda The Birth of a Nation like it’s a special midnight showing of The Room, and in the case of Jasper Pääkkönen’s bug-eyed psycho Felix demanding that Zimmerman take a “Jew lie detector test” in a scene that gets more intense and horrifying as each second passes. Lee’s intention is clearly to paint these kinds of men in a detestable light, as they should be and are, but he reserves special treatment for David Duke who is shown to defend his views with sincere beliefs in questionable scripture and with the kind of charisma you’d see in your average cult leader, making him the most charming man to ever head one of the most evil organisations in human history, and also the biggest monster in a group filled with nothing but monsters. Watching this movie, you can’t believe how truly hateful and twisted these people can be, and you want so desperately for them to get what’s coming to them, which may or may not lead to scenes where you’ll be applauding at how gloriously satisfying they may or may not be. It’s certainly a chilling and scary portrayal of such a deplorable group of people, but it rounds out with how it’s an incredibly sophisticated and entertaining cop movie, calling back to several movies of the era like The French Connection which bathed in how gritty and intense they could be. You’re very much invested in this operation, from how Stallworth instructs Zimmerman how to sound like him in some very funny scenes, to how they separately see it as an important mission for the greater good, or in Zimmerman’s case just another job that he’s been given to do. John David Washington, the son of Denzel, is a fully capable lead and seems to have inherited his father’s natural screen presence that makes him a likeable and charismatic person to be around, and Driver has some great moments as he’s starting to consider his own Jewish faith in a position where it could very well lead to his immediate demise. Together, they make you hope that their respective characters make it out of all this in one piece, because after you see the psychotic tendencies of some of these Klansmen, especially Felix who again is just the most scary individual you could come across in this situation, it really could go either way. Amidst all its strengths, though, is a stark reminder that no matter how well this investigation goes, it won’t come anywhere even close to punching out hate as a whole; the final few scenes are a testament to how things nowadays, in the current political climate that we live in, are perhaps a lot more dangerous than even back then, because prejudice is now in far greater power than it ever needs to be, and it can even prove to be fatal for an extremely unfortunate few. These are such disturbing and frightening times where progress and acceptance is threatening to take twelve steps backwards thanks to those currently in power, and films like BlacKkKlansman are vital if we are to both recognise that hatred is something worth fighting against, and celebrate the people who have in the past or even today fought in the good fight that will hopefully drown out all these toxic ways of thinking once and for all. It would be foolish to hope that hatred goes away forever, because no matter how much we want it to not be around, hate will always be a natural human emotion; but if we have people like Spike Lee who are able to point out what kinds of hatred need to be stomped out for good, then we could very well be on the path to a better, more inclusive, tomorrow. 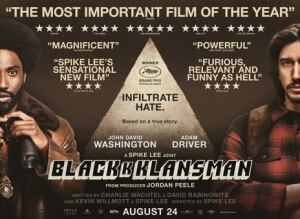 BlacKkKlansman is a stunning reminder of just how vile and evil some people can truly be, in a scathing attack by filmmaker Spike Lee on the hateful organisation of the Ku Klux Klan and the culture of prejudice surrounding it, which balances out to how it’s an excellent cop movie with some great lead performances and a style that’s unmistakably that of Spike Lee. This is an unmissable film in every capacity.